In the end, the Cleveland Browns will take it. With the ball a yard and a half outside what would have been the game-winning touchdown, the Jacksonville Jaguars had two shots to win the game, but the Browns defense stepped up and stopped rookie QB Blaine Gabbert to preserve a 14-10 win. The game had little dramatics till late in fourth when Phil Dawson pushed a 38-yard field goal that allowed the Jags a shot to march down to go for the win. Jacksonville got to the Browns one with :08 seconds left, and two passes into the end zone fell incomplete, one going to Jason Hill and the other with three seconds left to Mike Thomas. The play-calling was curious in the least, as Jacksonville leading rusher Maurice Jones-Drew was on the field, but never got a shot with the game on the line. The win improves the Browns to 4-6 on the year, while the Jaguars drop to 3-7. Chris Ogbonnaya led the Browns with 115 yards on 21 carries, while QB Colt McCoy was 17-for-24 for 199 yards with a touchdown. Jones-Drew ran the ball 19 times for 83 yards with a score. The first quarter was a stalemate, as both teams had a couple of possessions, with each team not able to covert. The Browns best shot was on a 3rd down from the Jaguars 49, and Greg Little had a ball hit off his hands. Jacksonville started their long drive for the first score of the game from their own 8-yard line with 5:43 to play in the first quarter. Gabbert handed off to Jones-Drew to covert a 3rd-and-1 from the 17, and on a 3rd and 6 from the 24 Gabbert hit Jason Hill for a 13-yard gain to give them a first at their own 37. Four plays later the Jags had another first down after two Gabbert scrambles to the Browns 48. It took them 8 plays into the second quarter for Jacksonville to hit paydirt, as Jones-Drew went for a six-yard score to give the Jags a 7-0 lead. The Jaguars touchdown drive was a deflating 18 plays, 92 yards, with a time of possession 9:53. The Browns finally got a big play to get close and eventually tie the game with 3:21 left in the first half. They started at their own 13 after a penalty, and they got a nice pitch and catch from McCoy to Greg Little for a 22-yard gain to go from the 16 to the 38. The play of the drive though was a nice pass to Jordan Norwood over the middle, and after shaking away, the former Penn Stater raced 51 yards to the Jags 7. A pass interference put the ball at the Jacksonville one, and Chris Ogbonnaya went in on a sweep for the tying score. The drive was 8 plays, 87 yards, and lasted 4:32. The half ended with the game knotted up at 7. 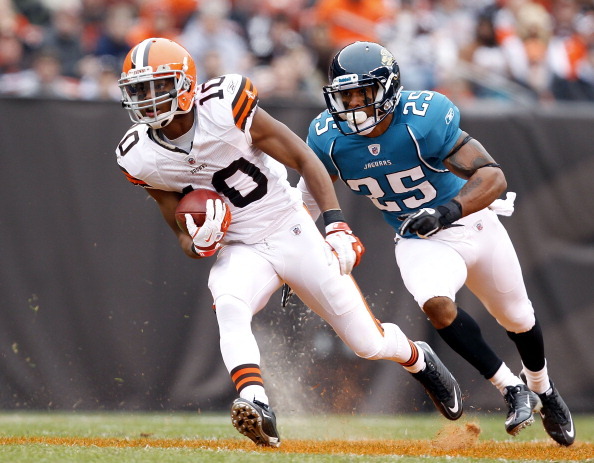 The Jags outgained the Browns 161 to 138, and Jones-Drew led the game on the ground with 54 yards. McCoy was 8-for-13 for 117 yards in the first half, while Gabbert was 11-for-17 for 97 yards. The Browns dominated the third quarter, as they actually hurt themselves by taking points off the board before a big McCoy mistake. The team got in position to kick a Phil Dawson 40-yard field goal, but the Jags were hit with the infamous “leaping penalty to give the Browns a first down. Pat Shurmur took points off the board to go for the TD, but on third down from the Jags 6, Dawan Landry jumped in front of a pass intended for Ben Watson, stopping the drive. The Browns defense didn’t allow much from the Jags in the quarter, and the third quarter ended with the game knotted at seven. 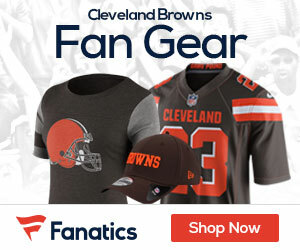 Cleveland continued to play better on offense, and finally broke through with a touchdown that gave the Browns a 14-7 lead early in the fourth quarter. It was a 12-play, 85-yard drive that was highlighted by McCoy going 5-for-6, going downfield twice to Owen Marecic, once to Little, and a touchdown pass of three yards out to Josh Cribbs, who made a pogo stick catch and toe tap for the score. Jacksonville came back with a drive to cut it to 14-10 with 5:39 remaining. Gabbert led the Jags from their own 20 to the Browns 24, hitting Hill for a big 28-yard gain to get it to the Browns 37. I’ll agree that a win is a win. I will also add that a win against a really bad team gets you nothing. While it’s good (and surprising) to see the Browns win, the team still looks like they will end the season with Zero wins in December. This was the last chance that the Browns would play a team that was bad enough to blow their own chances at winning. Last play of the game: Jaguar QB pitches out to the right flat. Browns Lose. It’s as simple as that. One on one coverage against Jones-Drew meant bad news for the Browns. Unless Gabbert throws to the left. At least the offense improved. It’s sad that we as Browns fans think that an offensive performance that puts out 14 points is an improvement. Well… technically, that was an improvement. It’s just not good. Not good at all. Not too excited about this, although it was good to see. This year is about evaluating what they have — and what they do not have. They do not have a running game. They do not have a right side of the OL. they do not have bookend CBs — yet. They do not have WRs that scare anybody — but Little is starting to show up. His numbers are comparable to AJ Green and better than Julio Jones. Not bad company to be counted among. We don’t know if they have a QB — yet, but there are signs that indicate they might. I wish we still had Vickers. Draft is going to include WR, DL, ROL and CB as priorities. Should be decent talent at all positions at the points they will be drafting. Need at least 7 -8 DLs to run a consistent 4-3. Top ten and top 20 first round picks, depending on how Atlanta finishes up. They will not break the bank for Andrew Luck — but they might get a crack at another desirable QB (trade bait, too). Gonna have to find at least one OLB that can fly.